Four main hiking trails provide access to Garden of the Gods. Siamese Twins, Scotsman/Buckskin Charlie, Perkins Central Garden and Chambers/Bretag/Palmer Trails bring visitors to the awe inspiring natural rock formations discovered by M.S. Beach and Rufus Cable. The park is free and open from 5AM - 11PM during the summer and 9AM - 5PM in the winter. Perkins Central Garden Trail - Originates at the main parking lot and travels through the largest rock formations. The trail is paved with only a 30 foot vertical gain and accessible to all visitors. Scotsman/Buckskin Charlie Trail - From the Scotsman Picnic Area the trail is a challenging 1 mile loop with excellent distant views of the Central Garden. Siamese Twins Trail - Begins at the Spring Canyon Trailhead with 150 foot vertical gain. 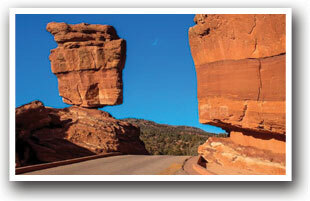 Provides access to the Siamese Twins Rock formation. Chambers/Bretag/Palmer Trail - Travels nearly the entire distance of the Garden. A challenging 3 mile hike with access to many of the parks rock formations. There are many resources at the Visitor & Nature Center including the 12 minute movie, "How Did Those Red Rocks Get There?" 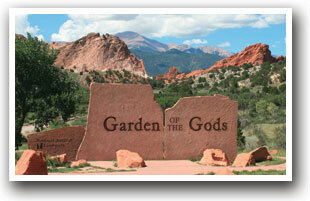 explore the geologic history of Garden of the Gods. If that's not enough, the park offers a 30 minute bus tour and hands on exhibits to better explain the parks existence. Stay in Old Colorado City! Park wide Cable TV and WiFi included! Full hookup pull-thru resort RV sites. Goldfield Camp Store, camper cabins with A/C, tent sites. 3 miles to GARDEN OF THE GODS hiking! Romance and Attraction Packages. 2 CABINS have kitchens, linens, towels, Cable TV/DVD, WiFi. In the Rocky Mountains at the base of Pikes Peak near Colorado Springs, in the small community of Cascade.